The statutory and voluntary audits that we perform are conducted according to the prescribed and recognised standards of the IDW (Institute of Public Auditors in Germany). As we also audit listed companies, we have been subject to peer review since 2002. 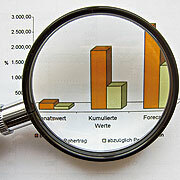 Our auditing services are available throughout Germany and Europe. Conducting of statutory and voluntary annual audits and consolidated annual financial statements along with issuing of professional audit certificates and audit reporting.